Are you a beginner or expert seamstress? Do you know someone who is learning or enjoys sewing? Learn how to make a pin cushion the EASY way. It makes a great addition to your sewing area or a thoughtful gift for someone else. This is they type of project that is easy to customize and fit to any theme or decor, use your favorite colors or match grandma's favorite quilt. It is also a frugal DIY, my favorite kind! I had this frame laying around, plus I had the buttons and scrap fabric on hand so it was essentially free. 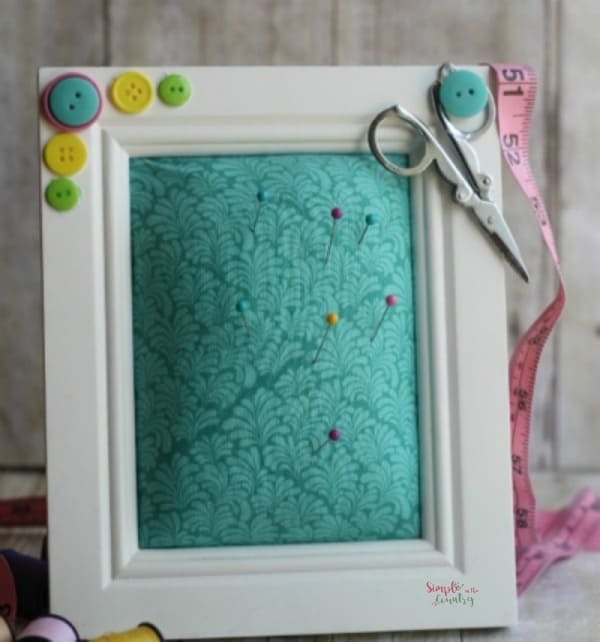 Scour thrift stores and yard sales for unique frames, you could make your framed pin cushion even more special by using a piece of fabric with meaning like a baby quilt, a scrap of lace from your mothers wedding gown, or the pinstripe dress shirt your husband said ” I do” in. Remove back and glass from frame- set glass aside, save for another project if you want. Place back of frame on fabric and cut around leaving 1 1/2 ” allowance on each side. 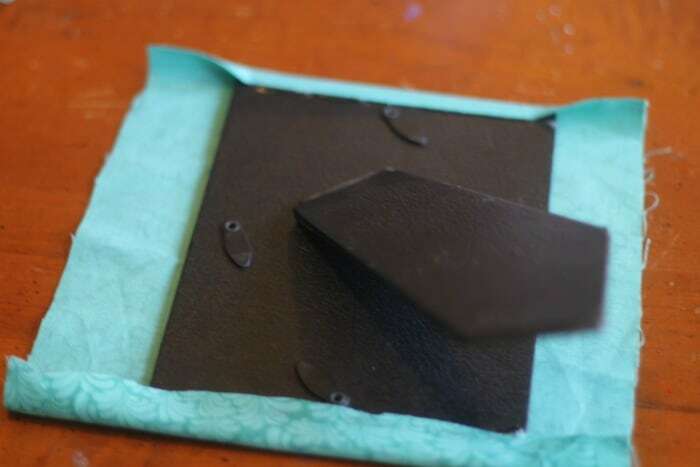 Hot glue frame 1/8″ from the edge on one end, press fabric into hot glue just barely overlapping.Repeat on opposite end. (You want your fabric slack to create the pillow effect). Repeat the process again down one side, folding the corners as if you are folding a present. 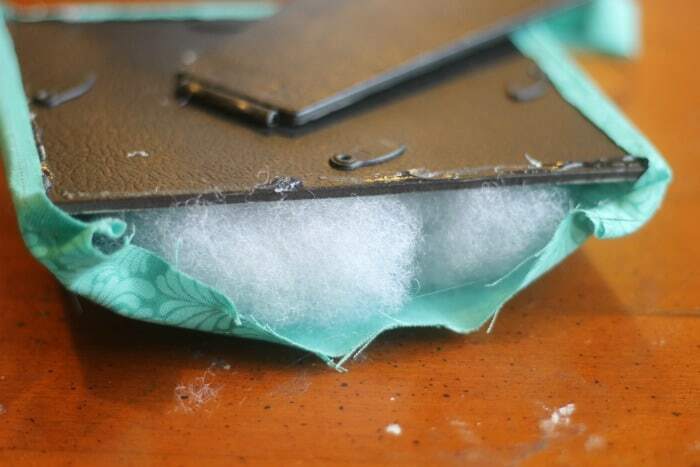 Stuff batting between backing and fabric so that it is fluffy but still loose. Hot glue final side down. Place fabric covered backing inside frame and secure. Lay out a practice pattern with buttons until you like the look of it, then hot glue them down being generous with glue to keep secure. 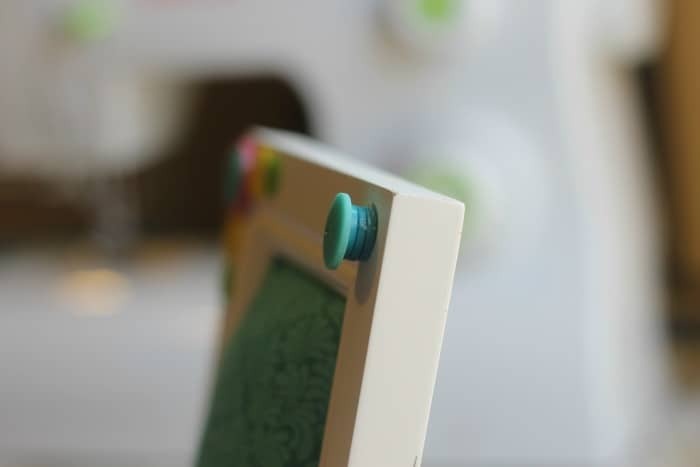 To create the hook to hold a pair of little scissors stack and glue 3 small buttons, top with a larger button (just be sure your scissors fit over it). Glue to frame. 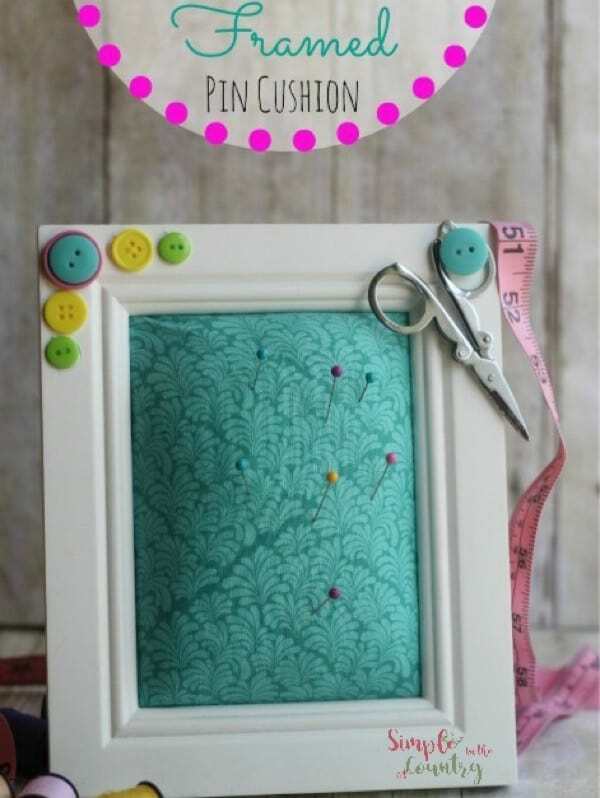 Now that you know how to make a pin cushion all you have left to do is add stick pins, needles, or safety pins to create a helpful little sewing station! 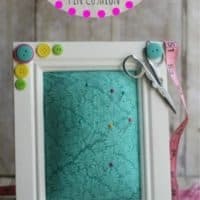 One of the prettiest DIY frames I have seen! 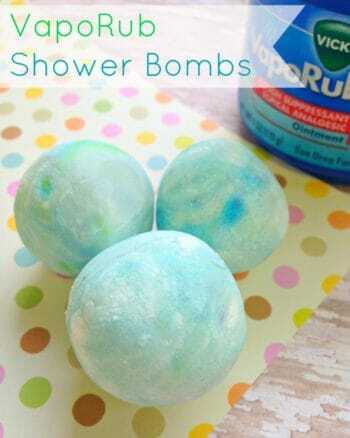 Have to try to make it myself! I love it. It’s cute. Would make a great gift also. 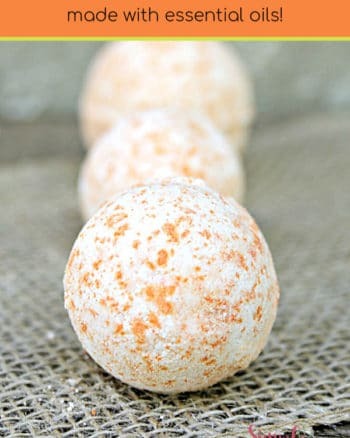 Seems so simple to make. What a great idea because I have one of the little tomato shaped ones and it’s so small at least with this one you cannot lose it! It looks so beautiful! I have to show this to my neighbor who does a lot of crafts – she will love it! 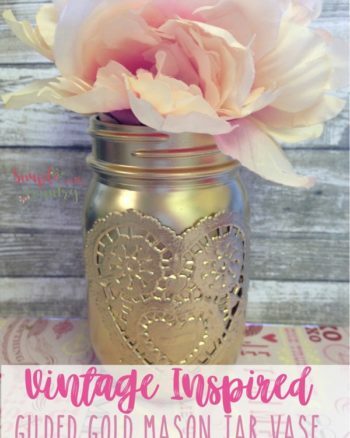 Such a neat idea..
My mom would love this little DIY Craft project. I wish i had the time and patience to do all these cool stuff. What a cute craft idea! I love how simple it is to make and how cute it turns out! What a cool idea! I’ve been wanting to really learn more about sewing since I have the sewing machine and this would be a great thing to make for it! Oh so much cuter than those little tomato pin cushions! I love this!! This is such a cute and practical gift!!! This would be perfect for a friend of mine. This is really cute! I think I may have to make one of these and put it next to the sewing machine! I love this! Wow what a great way to make a easy and nice gift. I will be checking this out after I get all of my supplies. I am not a sewer but its such a cute idea! Super cute. I barely sew, and I’d love to sew more. This would be great for some family members. This is great & so adorable! Part of my goals for this year is to start getting crafty so thanks for the share because I have a feeling i’ll be needing this! lol! I don’t sew nor am I crafty but this is absolutely adorable! What a unique idea! I might make this for a friend who loves to sew…it would make such a great gift! What a neato idea! I absolutely love it. My mother in law is a huge sewer, so I might make her one for her birthday! How Fun, Please come back and show us if you do. This is such a great idea. I have a friend who recently starting sewing. This will be perfect for her. It is so quick to make and it can be left on the desk, hung on the wall, or laid flat… It makes a great gift for someone new to sewing! I love how adorable this turned out! What a fun and simple idea to keep up with the pins. I am always loosing mine! Now that is certainly a creative idea and a great way to re use items you might have thrown away! It is also functional for those of you who do a lot of sewing! This is just adorable! My mom is an avid seamstress, she’d love this!